Providing you the best range of ceramic fibre ropes with effective & timely delivery. 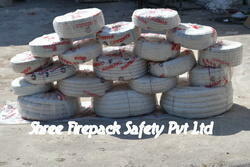 Shree firepack safety pvt ltd offer variety of Ceramic Fibre Ropes based in ahmedabad,gujarat,india. Round braided rope is dense, resilient, high performance ceramic fiber material fabricated from ceramic fiber yarn braided around a core of ceramic fiber rope to form a packing in round section. It is widely used for a broad variety of high temperature gasketing, packing and sealing application. Square braided rope (square packing) is dense, resilient, high performance ceramic fiber material plaited from E-glass, stainless steel wire or high temperature alloy wire inserted ceramic fiber yarn to form a packing in square section. Looking for Ceramic Fibre Ropes ?